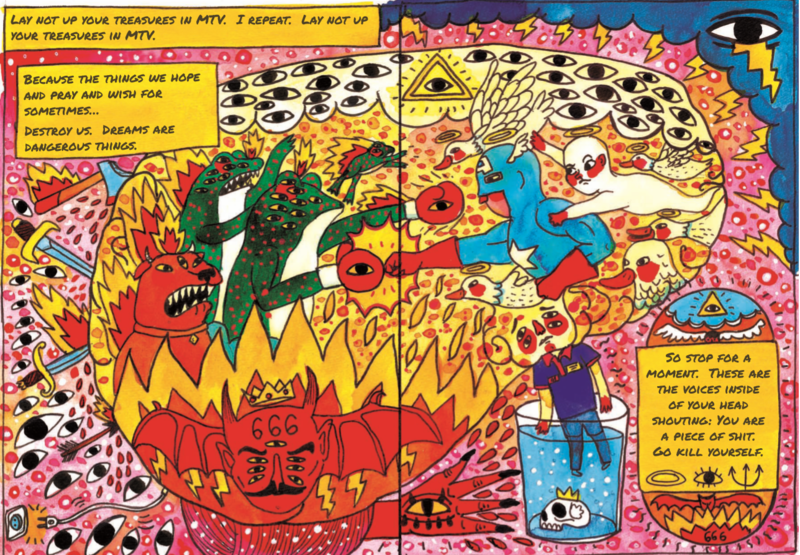 The Incantations of Daniel Johnston, by Ricardo Cavolo & Scott McClanahan. Columbus, Ohio: Two Dollar Radio, July 2016. 132 pages. $17.95, paper. In Daniel Johnston’s early years in Texas, when he was just beginning to find an audience, in order to give someone a copy of his album, he’d have to run back home and record the whole thing over again, from start to finish, in a single take. Aside from illustrating his technical limitations, this detail could be used to show his authenticity, or even to foreshadow his later bouts with mental illness. But to say that madness is “doing the same thing over and over and expecting a different result” is a projection of an industrialized value system. In true madness, as in true authenticity, there is no expectation involved. For the afflicted, there is nothing to be learned from mental illness. It’s not a teacher; it’s an adversary, a palpable, malicious entity. A devil. 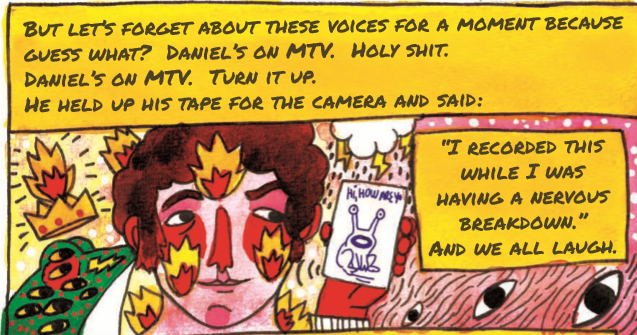 When I heard that Scott McClanahan and Ricardo Cavolo had made a graphic novel about Daniel Johnston’s life, I had mixed feelings. 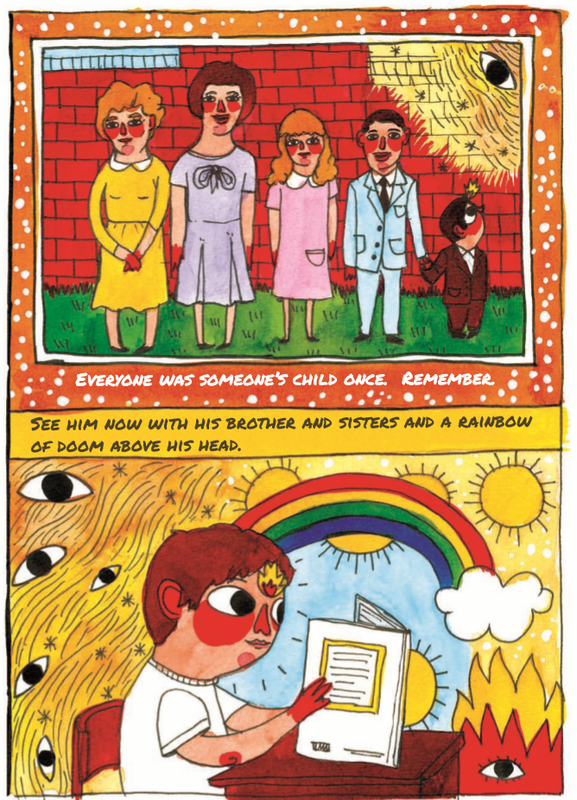 As a Daniel Johnston fan, I’ve sought out all the retellings of his story that I can, so I was really excited to read it, but soon some reservations crept up on me—there seemed something discomforting about the desire to peer into the lives of people with serious mental illnesses. A cynical view might be that we’re drawn to gawk, to either make us feel more sane in our own skins, or to provide a set period to recreationally entertain the possibility of our own instability. But by that logic, how could I even justify being a Daniel Johnston fan at all? With Daniel Johnston, his troubled past is inseparable from his music. Despite (and in some part because of) the obstacles, he’s managed to create a prolific, often brilliant and moving catalog of music. For fans, the Daniel Johnston story is essentially mantra, or a collection of psalms or incantations. His albums are checkpoints, frames of reference between the psychotic breaks which inform them. 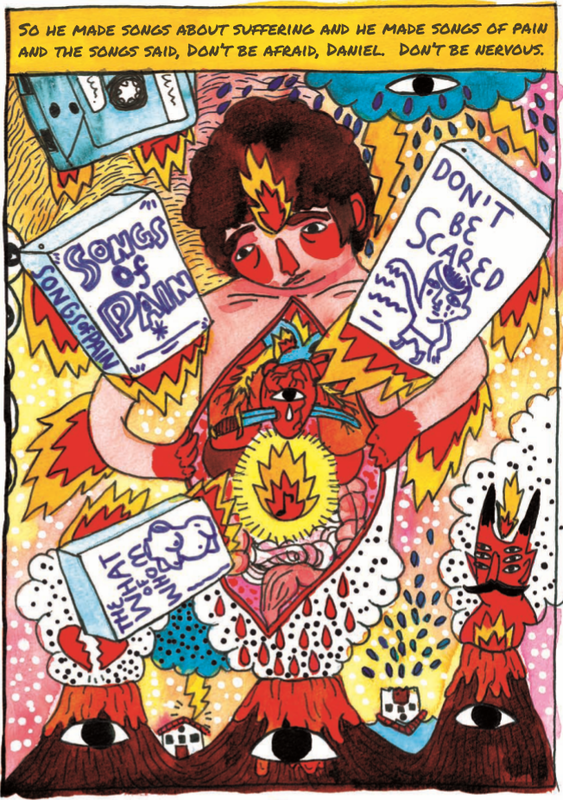 The Incantations of Daniel Johnston takes us through Daniel’s life, starting at his birth, through his upbringing, years of musical success and failure, and strange personal tragedies. Winding through all these is his ongoing battle with Bipolar Disorder. The narrative itself of Daniel’s life, though almost cartoonish on its own, is relatively straightforward (though I won’t spoil it here), and in the first half of the novel McClanahan’s writing is fittingly conversational, without excess proselyzing or embellishment that would distract from the drawings. This type of purposeful simplicity mirrors Daniel’s music, which is lyrically and musically simple, but gains a new brightness when placed in the light of his circumstances, and in the pained quavering of his singing voice. What this means is there’s a lot going on here, too, that’s purposefully left unwritten. The narrative voice shifts focuses and audiences, sometimes referencing the reader and sometimes the illustrations themselves. This rapidly shifting gaze of the writing, and uncomfortable stare of the devilish eyes, keep the book clipping along, and make it hard to look away. Ricardo Cavolo’s illustrations are amazing. Colorful and frantic, like a punkified offspring of Diego Riviera and Hieronymous Bosch. In marker and watercolor they juxtapose images of unearthly doom and very human emotions such as fear and heartbreak, with christian-esque iconography like angels and dagger-pierced hearts, and lots and lots and lots of eyeballs. 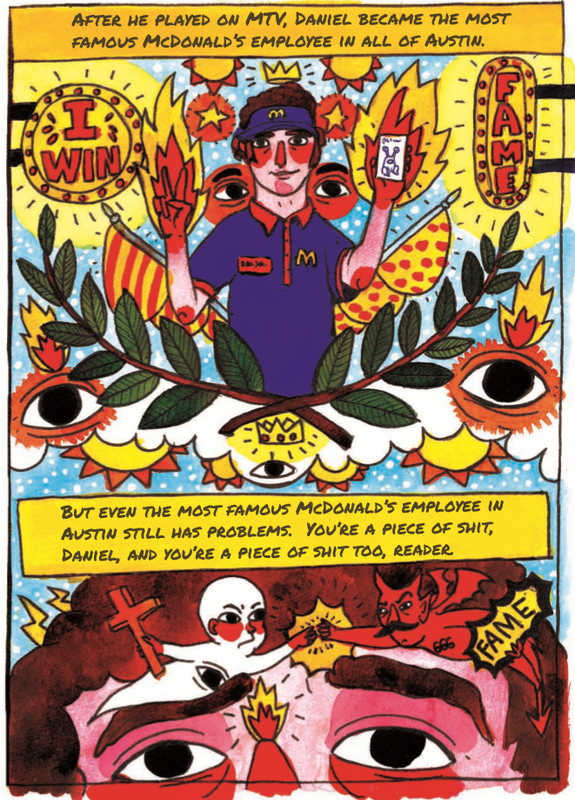 It’s easy to get lost in the meticulous, playful images: Daniel with a devil-toad on his back, breathing fire as he fires his manager. An enormous, anthropomorphized, anatomically-accurate heart, wading through a hellish black river while a fanged volcano spouts spiked eyeballs behind it. Impressively, amidst this chaos, Cavolo even gets down to the oft-repeated details that Daniel Johnston fans love, like the weightlifting bench in his brother’s garage that Daniel set up his keyboard on. In the latter part of the book, as Daniel’s breakdowns begin to completely overtake him, the writing begins to turn away from Daniel to break down everything the breakdown breaks, through a series of redefinitions. McClanahan’s self-aware struggling for meaning draws out several conclusions and morals, and then snips them off: What can we make of a story like Daniel’s? Why must we make anything of a story like Daniel’s? What does it say about us that we try? 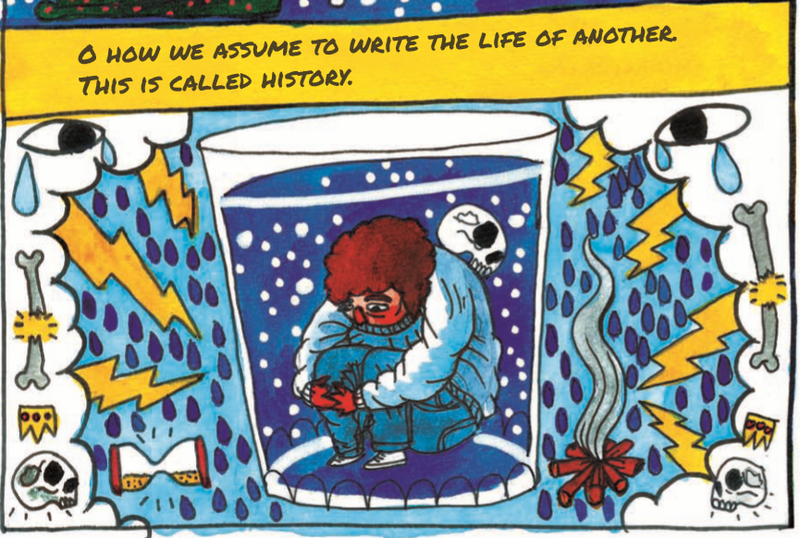 It’s here that the authors reveal that they have the same concerns I did about telling and retelling this story, and are clearly aware of their place in the creation and maintenance of myth. However, this also might have been the most enlightening moment of the novel. Most of the Daniel Johnston fans I know have suffered through at least some degree of mental illness, and personally, I think it’s no coincidence that I was drawn to his music only recently, when I accepted my own depression and anxiety as something to fight against rather than just a personality quirk. 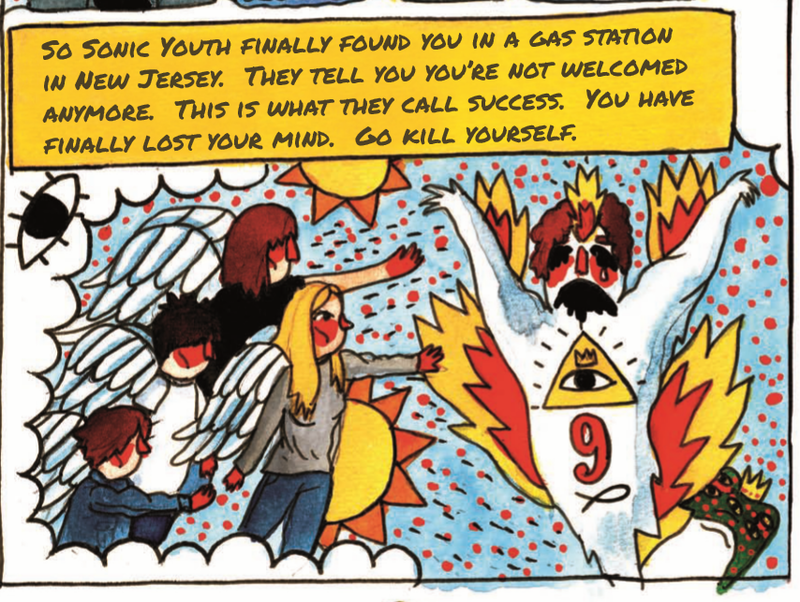 Daniel Johnston is at once an easy and extremely difficult person to talk about. While we can draw what we will from his story as we retell it, few can truly sympathize with his experience. And while he thrives on making connections with listeners, it’s the deep reverence of his fans that pushed him toward a level of notoriety that harmed him. Karl Schroeder writes, studies, teaches, edits, and gazes into the abyss in Marquette, Michigan.